Even though they are mostly associated with awesome standalone guitar effects, Electro-Harmonix is no stranger to multi-effects platforms. As a matter of fact, they have more than few in their current lineup. Electro-Harmonix Epitome is definitely among the better ones. This compact multi-tool features a very balanced selection of effects, all of which come with enough EQ-ing power for you to mold the tone exactly how you like it. There is a reason why its deemed to be among the best pedals of this type out there. Let’s do a quick rundown of the Epitome and check out what makes it so good. One thing that rarely changes with Electro-Harminix pedals, no matter what category they belong to, is the enclosure. Don’t fix something if it ain’t broken is a piece of advice that EH holds at a very high regard. Enclosure of the Epitom is pretty much the very same traditional one seen on other models by this brand, only a bit wider. 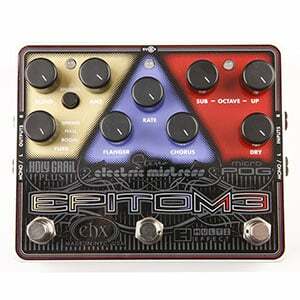 Epitome brings three different types of effects. You get an octaver, flanger/chorus section and a reverb section. Each of these is color coded, making the controls easy to recognize even in poorly lit environments. Needless to say, each effect also comes with its own foot switch, meaning that you can engage any number of them at the same time. Seeing a clean layout on an Electro-Harmonix pedal is something we were taught to expect by now. With clearly color coded sections, each effect cluster is easy to recognize and use. Aside from the standard EQ knobs, Electro-Harmonix also included a mode selector knob for the reverb section. You have a selection of classics such as the spring, hall and room reverbs at your disposal, making this a pretty flexible unit. You would be surprised how hard it is to build a proper octave pedal, even if you making a standalone unit. Designing a lag-free octave as a part of a more complex design is even harder. However, Electro-Harmonix managed to do just that. Every single effect on this pedal works flawlessly. Reverbs are pretty organic, even the more modern ones while the chorus gives you that natural vibe many turn to boutique pedals for. Each footswitch is far enough from one another that you won’t have situations where you turn on the wrong one. Everything about this pedal is designed with utmost utility in mind. For more info about the Electro-Harmonix Epitome, click here.